SKU: 9780982419069. Categories: Business, Careers. Tags: federal careers, federal jobs. 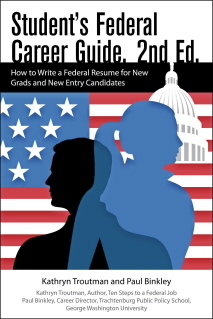 Ten Steps to a Federal Job, 3rd Ed is a total campaign approach for the first-time federal job-seeker determined to land a high-quality federal position. The book includes updates from the 2011 Hiring Reform, samples of federal resumes, and step-by-step instructions on how to apply for federal positions. This book targets the many Americans who are currently out of work and searching for stable employment. Many have been out of work for a year or more and come from private industry. 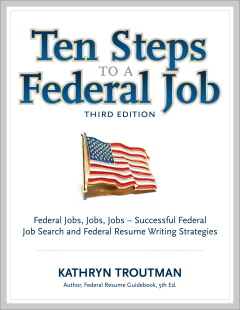 Ten Steps to a Federal Job provides clear instructions to the first-time federal job-seeker on how to execute each of the ten steps. The book includes charts, figures, samples, and easy-to-understand language. The simple step-by-step approach of this book has been appreciated by: Americans over the age of 50 with limited job prospects in the private sector; human resources personnel; employment counselors; and Veterans’ counselors. Kathryn Troutman lives in Catonsville, MD and is the founder and president of The Resume Place, Inc., a service business located in Baltimore, MD. Resume Place specializing in writing and designing professional federal and private-sector resumes, as well as coaching and education in the federal hiring process. For the past 40 years, Troutman has managed her professional writing and consulting practice, publishing, and federal career training business. With her team of 20 Certified Federal Resume Writers, The Resume Place advises and writes more than 300 federal resumes per month for military, private industry, and federal clients world-wide.Internationally recognized as the “Federal Resume Guru” by federal jobseekers and federal human resources specialists, Troutman created the format and name for the new “federal resume” that became an accepted standard after the SF 171 form was eliminated in 1995. She is the pioneering designer of the Federal Resume based on her first book, the Federal Resume Guidebook, which already is in the fourth edition. The Resume Place, Inc. books are distributed by Cardinal Publishers Group.